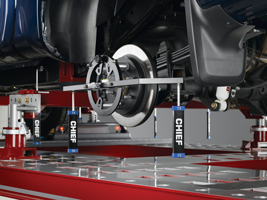 Clarksville Auto Center utilizes the Genisus Laser Measuring System to ensure accurate frame measuring and alignment. More and more customers and insurance companies are requiring the use of computerized measuring as part of the repair process. And Chief’s® Velocity™ is far and away the most sophisticated – yet simple to learn and operate – system available in the industry today. Fast and easy set-up with full-color, one-page reports on the exact condition of the vehicle’s frame before, during and after repairs have been made for indisputable evidence of damage severity and quality repairs. Chief’s Velocity is the computer measuring system the industry turns to most. And who can blame them? After all, Velocity’s sophisticated laser technology no only identifies damage you can see — but primary and secondary damage you can’t see — helping your techs develope more efficient repair plans eleminating comebacks and helping you find and get paid for hidden damage. And Velocity’s durable scanner and high-tech targets eleminate distortion and deliver pinpoint accuracy each time, every time. Its proprietary software helps techs identify incorrect pull set-ups BEFORE they are made to prevent additional damage and speed up the repair process.